Find out all the ways you can share your flipbooks to get more exposure. There are many ways in which you can share Flipsnack flipbooks. 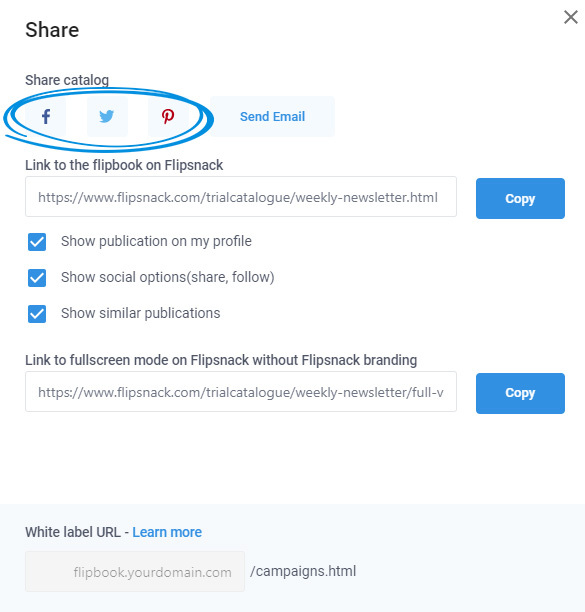 Whether you want to share a permanent link to your flipbook or you want it integrated in your website, just go to My flipbooks and locate the flipbook you want to share and click on the Share tab. Social options - Go to the Share tab and share your flipbook on your favorite social media. Sharing options include Facebook, Twitter and Pinterest. 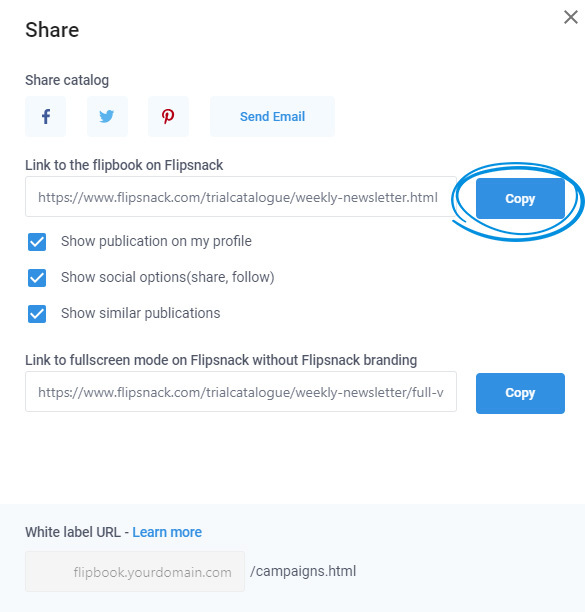 Direct link - by selecting this option, a new personalized preview page hosted on Flipsnack.com will open. 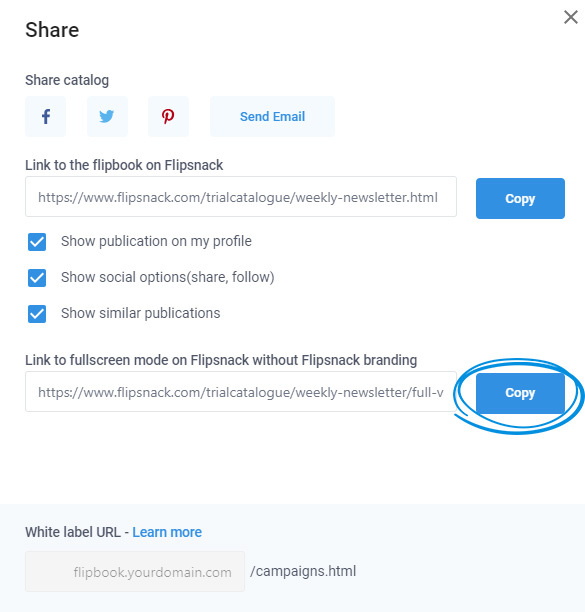 Here's an example of how a Flipsnack direct link looks like. Shareable Full-screen URL - elegant and clean way of sharing your flipbook without seeing extra features or related publications. Read more about it here. Important: this feature is available for all our premium members. Read more about our premium subscriptions here. Here's an example of how a Flipsnack full-screen link looks like. 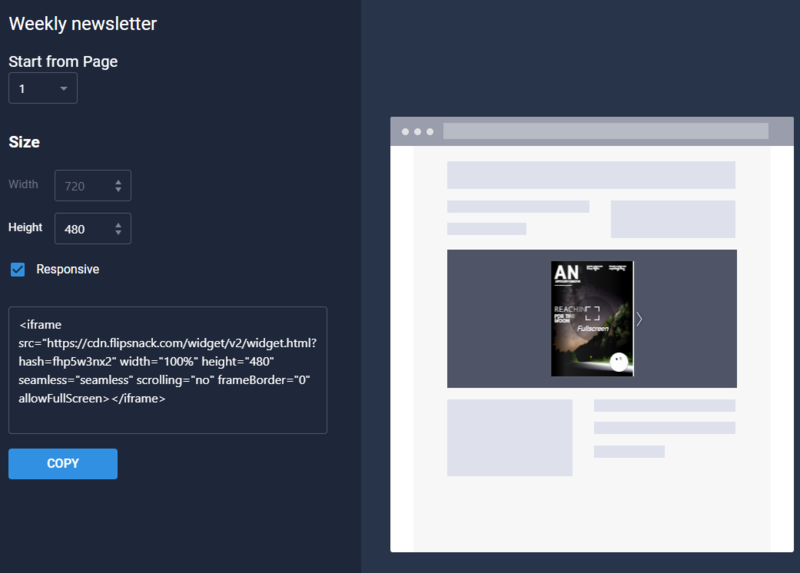 Embed code - from the Embed tab, copy the embed code and then paste it on any website that supports embeddable content. 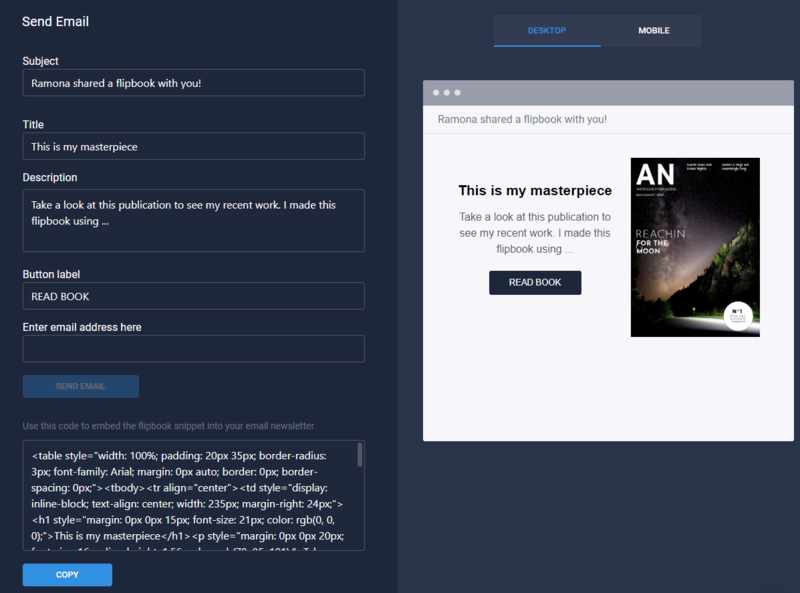 You can choose your embed size, if you want your flipbook to be resposible or not and the page you want your flipbook to start from. 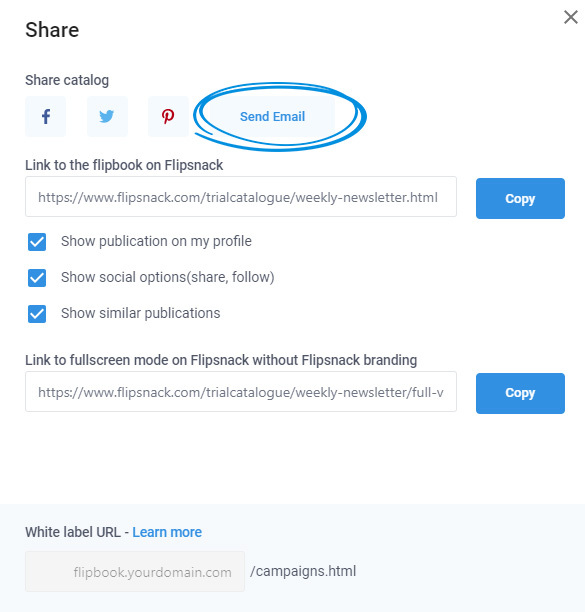 Email - from Sharing option, you can select to use the Send Email feature. You can edit the subject, the title, the description and the button label. Another cool thing you can do is check how your email will look for readers who open it on their mobile devices. 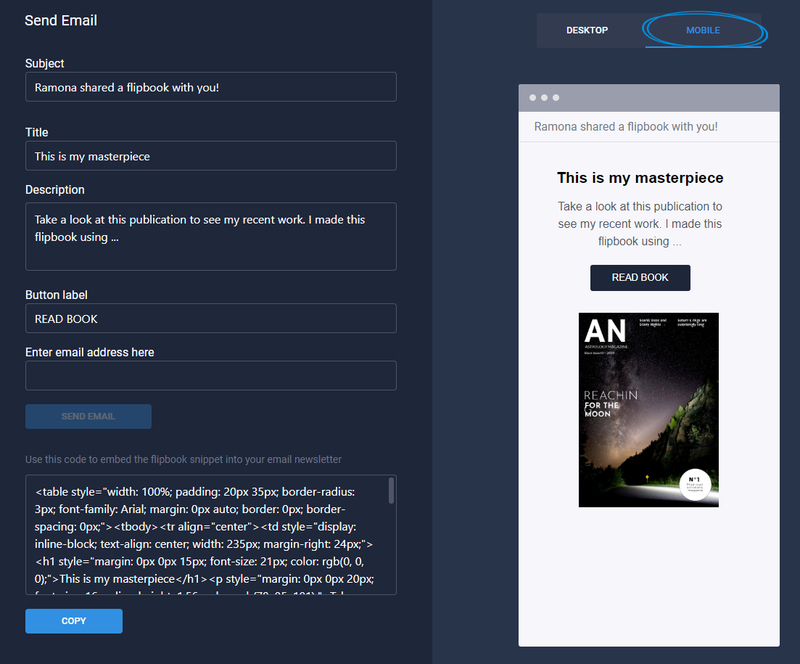 Once you are happy with your flipbook both on desktop and mobile devices, you can copy the flipbook snippet and paste it into your newsletter using your favorite email client. Download options - If you go to the desired flipbook, click on the three dots and select Download, you can see our download options. Download HTLM5 and Download PDF - You can download your interactive (HTML5) or static (PDF) flipbook offline and you can then host it yourself. The downloaded flipbook will remain premium indefinitely. 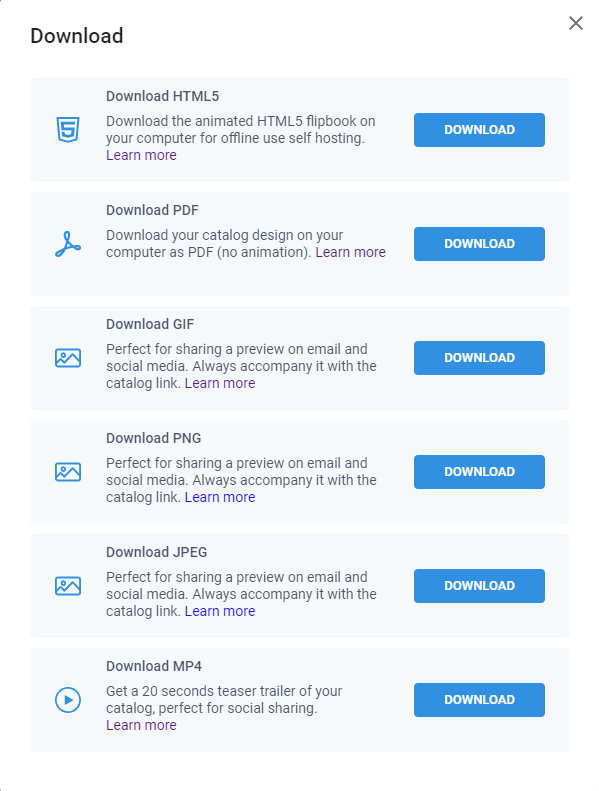 Important: the Download HTML5 feature is available for our Business and Enterprise members, while the Download PDF feature is available with all our premium subscriptions. Read more about our premium subscriptions here. Download Video and GIF - you can download a preview of your flipbook in MP4 format (up to 30 seconds long) and GIF format (the first 7 pages) so you can share them on social media along with a link to your entire flipbook. You can read more about video download here and GIF download here.